Capt. John Campbell served as a fighter pilot in the U.S. Navy before graduating from the University of Pennsylvania at Stroudsburg. His airline career spanned thirty-one years, starting at Seaboard in 1967 and finishing at FedEx in 1998. During the four summers following his retirement, he was a volunteer assistant-coach at the women's basketball camps at the United States Military Academy and the United States Naval Academy. He is survived by daughters Shannon Campbell, Erin (Keith) Dunkerley; sons, John (Kirsten) Campbell, Jr; Ryan "Rocky" (Kathryn) Campbell; five grandchildren, Austin, Ashlyn and Avery Campbell, Ezza Dunkerley, and Brady Kulla; his sister, Rosemary Campbell; his brother, Terry (Sally) Campbell; many nieces and nephews; and his former spouse, Dottie Druze. 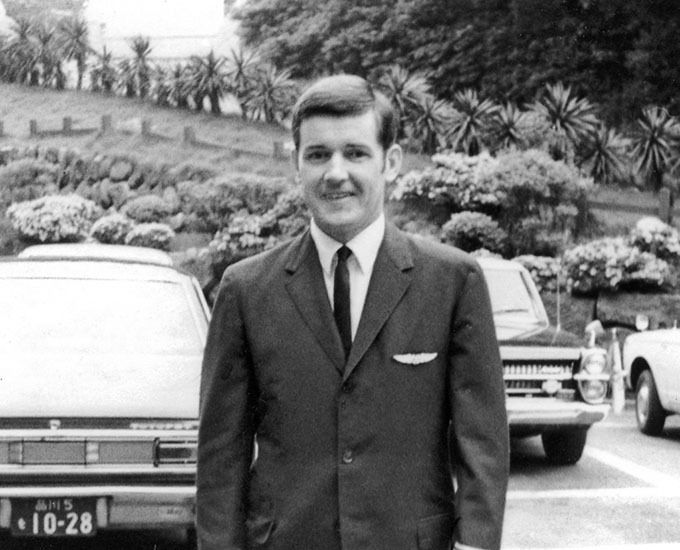 John is seen here early in his airline career.